Write a short paragraph that explains the central idea of the article. Use at least two details from the article to support your response. ​THEN: Collecting Basketball CardsKent and Allie collect basketball cards. Kent has twenty cards and Allie has thirty cards. Kent’s mom says that if Kent helps take care of his little brother while she prepares dinner, she will give Kent five cards every Monday. Allie’s mom says that if Allie helps fold the laundry, she will give Allie four cards every Monday. Allie tells Kent that she will always have more cards, but Kent isn’t sure about that. Will Allie always have more basketball cards than Kent? Show all of your mathematical thinking. THURSDAY, JUNE 14: You don’t have to change a thing. The world could change its heart. I think of the world as a family. When one of us is suffering, we must all pitch in and help.” Mahatama Gandhi summed up his philosophy of life with the words, “My Life is my Message”.Describe what makes you who you are today. How will your life become your message in the future? What do you think are the most important things to remember to follow in the years to come? What do you think are the most important things to do in your life that will lead to your happiness? Now, write an essay explaining what will make life good and meaningful for you. You MUST mention at least two other texts (fiction and non-fiction books, songs, poems) that helped you grow your perspective. 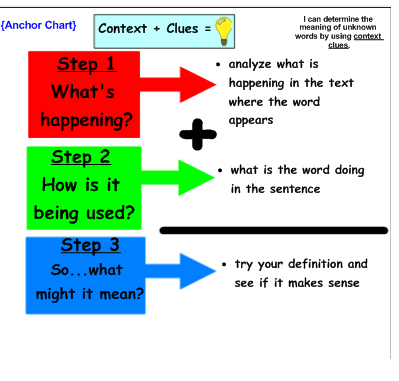 Add specific text-based evidence to support your thinking. CONSIDER THIS, TOO: There are many books that talk about the meaning of life. Your teacher talks about living a “good” life. What do you think are the most important things to remember to follow in the years to come? What do you think are the most important things to do in your life that will lead to your happiness? Now, write an essay explaining what will make life good and meaningful for you. ALSO, MAKE SURE YOU ARE READY TO DISCUSS CHAPTERS 30-32 OF I AM MALALA. What role did education play in the lives of the Navajo people? How did this impact their lives? Viewing different perspectives: How can immigrant students succeed in school? Have students read three articles. Edit the write prompt in both articles to focus on these questions: - In this article, what is the student experience like in their school? -What challenges are faced by the students? teachers? -If not explicitly stated, how do you think students feel about their schooling? Compare: After students read, have them compare the similarities and differences between the experiences of the students. 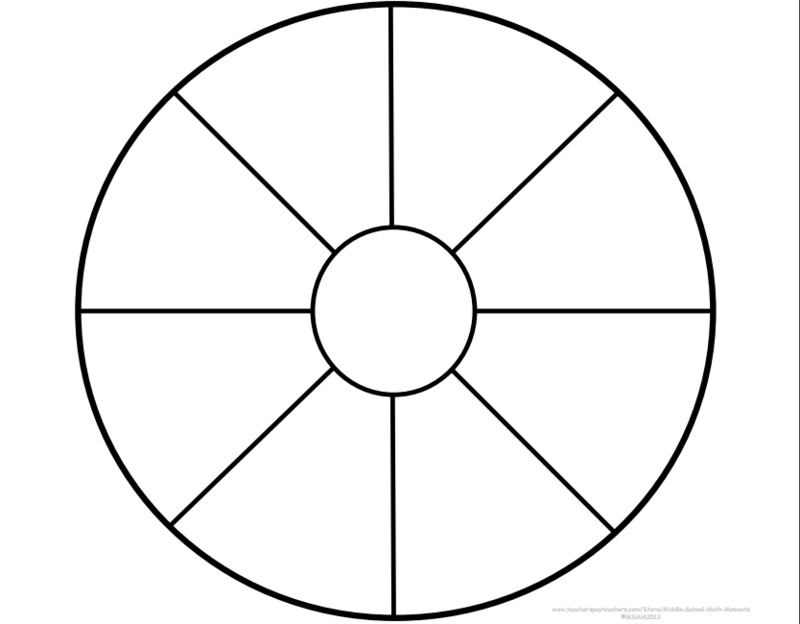 You might instruct students to create a Graphic Organizer to help make their thinking visible. Writing Extension: After reading both articles, have students create a list of ways to help immigrant students succeed. How has western education evolved alongside a thriving and evolving society? How has the curriculum taught in these schools evolved? Use evidence from the article to support your response. What is the debate over the purpose of education? REFLECT AND RESPOND: ​In your social studies notebook, reflect and respond: Use this article to answer the comprehension question, "How might racial bias impact a student’s educational experience? How does this impact equitable opportunity?" REFLECT AND RESPOND: WHY DO YOU THINK BIAS EXISTS? WHAT ARE WAYS IT CAN BE PREVENTED. AFTER YOU RESPOND, TALK IT OVER WITH A PARTNER. Period Three: I am Malala. Please work on new packets. We will discuss Socratic Seminar style on Friday--chapters 15-19. Period Five: Students should complete chapter 9 assessment and I-Ready diagnostic assessment. Please distribute Math exemplar: Thursday Night, Friday Morning. Students may begin and finish for homework. Reflect and respond in your social studies notebook: What need were schools intended to meet? How has the definition of equal opportunity evolved-changed? Use evidence from the article to support your answer. Period Eight: What stuck with you today? MONDAY, MAY 21: GOOD MORNING! I WILL NOT BE IN TODAY. GOOD LUCK AT YOUR CONCERT. FOLLOW THE THREE B'S. I WILL SEE YOU TOMORROW! Period One: Our spring concert will be presented this morning from about 8:50 to 10:15. Prior to concert, you should log into book and reading logs, read independently or work in poetry anthologies. ​MALALA CHAPTERS 8-10 DUE TUESDAY. WE WILL HAVE SEMINAR FOR CHAPTERS 6-10 ON TUESDAY. BE PREPARED FOR ALL. Poetry anthologies should be completed by TUESDAY, MAY 29TH HARD DEADLINE GIVING YOU AN EXTENSION. ​BE SURE TO INCLUDE IMAGES AND ORIGINAL ARTWORK, TOO. MAKE IT LOOK BEAUTIFUL. Periods Five & Six: Carnegie Hall practice for some students. Rest of class should work on tasks posted earlier. Period Eight: Pack it up for 2:25 dismissal! Eggxcellent Extravaganza team please work on planning event and detailed note for Mrs. Nealy. Website team please build- pages should include Homepage,, Start with Hello, Malala, Kindness Counts and more. Please share me in on all documents. Thank you. Make sure all Cay activities are completed. We will share tomorrow. Period Five: Zombie Math-I-Ready. Not sure about dance club periods 5 and 6. There is glee club practice periods 6 and 7. Period Six: Students may continue independent work and partnership activities. Period Seven: Science prep in classroom. Period Eight: What stuck with you today? How are you feeling? 2:25 dismissal. Please make sure chairs go up. Thanks and have a great day. Poetry anthologies should be completed by Monday, May 21st. Write a short response to summarize the disagreement between any two people or organizations in the article. If you were to support the claims made by only one of these parties, who would it be? Why? MATH PROBLEM OF THE DAY: COMPLETE IN MATH NOTEBOOK: Twelve friends shared 8 pounds of strawberries equally. Alicia and Carlos wanted to know the number of pounds of strawberries that each friend received. 2. COMPLETE MID CHAPTER CHECKPOINT FOR CHAPTER 8. 3. WORK ON CHAPTERS ONE AND TWO OF CAY. ANSWER QUESTIONS AND PREPARE FOR SEMINAR. 4. WORK ON ELA TEST PREP PACKET DUE TOMORROW. Good morning...Please TAKE THE CHAPTER 7 POST ASSESSMENT TEST...DIVIDERS MUST BE GIVEN OUT, USE SCRAP PAPER AND do NOT RUSH THROUGH EXAM...PLEASE ALSO MAKE SURE You ARE WORKING INDEPENDENTLY...and finish the assessment...HAVE A GREAT DAY. I will see you tomorrow! Please email me if you have any questions- concerns. Period Two: I can deepen my understanding of Westward Expansion by explaining why technology was essential. What technology was essential for Westward Expansion to happen? Explain why that technology was essential. As you read, use the highlighter tool to identify how industrialization helped make Westward Expansion possible. When you respond to the Write Prompt, be sure to use the text evidence you highlighted to support your answer. What was the main event in the article? Was the main event helpful or harmful to society? Make an argument and defend it with specific details from the article. Comparison: Choose two groups of people that were described in the article. How was their experience of the event similar? How was it different? Write a response that compares the perspectives of two groups of people using details from the article. FINISH FOR HOMEWORK IF NOT DONE SO IN CLASS. BUT THERE SHOULD BE PLENTY OF TIME TO COMPLETE. Period Three: Westward Expansion Book Clubs Part Three. Independent work. It will be reviewed and discussed in class tomorrow. Periods Five and Six: Glee club and Dance Club. For the rest: I can be a compassionate and responsible global citizen by responding thoughtfully and critically to a new movie from The Story of Stuff project. Students choose a new movie to watch and write a summary and response for. They may print and leave on teacher’s desk in front or back of room. All kids have headphones and can do this quietly and independently. Period Six: Gardening club with Mrs. Gottlieb. (Bryan, Giancarlo and Aaliyah). Period Seven: Science prep in classroom with Mrs. Gottlieb. Part Three of Westward expansion book clubs are due tomorrow. Make sure you are adding on to what you are learning about the time period and come prepared to have a post it chat. Finish the Newsela work that was assigned in class. PLEASE TYPE YOUR WORK AND SUBMIT TO MRS. DAVIS. BEGIN AND FINISH FOR HOMEWORK. MAKE IT LOOK BEAUTIFUL BY COLORING AND ADDING IMAGES. For my birthday I received some wonderful birthday cakes! There was one cake that had many different flavors all in one cake! The cake was 4/12 chocolate, and the rest was carrot and yellow cake, but not in equal amounts. What could this deluxe birthday cake look like? How do you know? Remember to use as much math language as you can. Testing items are under my chair by the closet (the large green trays), you can bring those the room as well or send 2-3 students to pick them up so that they can test. If testing is not feasible, students can access their google form response sheet via the link that I have shared on google classrooms. "This article describes a few different ways that people are responding to the tragic shooting last week in Florida. Highlight details in GREEN that show different responses to the event. Make an annotation in the margin summarizing each person or group’s perspective." Before Reading: STOP AND JOT what you've heard so far and what questions you still have regarding the shooting in Florida. Respond to the Write prompt. Be sure to reflect on the different perspectives presented. Explain what each side believes with text based evidence to support each claim. Analyze: Summarize the disagreement between people or groups in the article. If you were to support the claims made by one side, which claims would you support? Explain your thinking using evidence from the article. Write a "40 or 50 cent word" summary that includes that 5 w's and 1 h along with your own thoughts in response to the article. Ask them which individual or group from the article they most agreed with, and why. Further Research. Whose perspectives are still missing on this topic? Conduct research using AllSides.com to learn more about what people are saying about this topic from different perspectives. Differentiation. Tweak the PRO Assign Instructions for students who might need more explicit direction. "This article describes a few different ways that people are responding to the tragic shooting last week in Florida. Mark details that show the opinions of students in BLUE, and details that show the opinion of law makers in GREEN." What actions can individuals take to respond to an issue they care about? (You may cite specific evidence from any of the two articles you have read). What issue or issues in your community do you notice? Practice writing a summary and using QAR to come up with your own questions. Why do some retailers manufacture clothes in Bangladesh? Do Americans benefit from this? Why or why not? Student Katie Rowe says higher clothing prices might hurt sales. What facts from this article support or contradict her opinion? How might having higher US clothing prices help or hurt developing nations? Keeping those pros and cons in mind, should clothing retailers raise prices? Why or why not? Period Three: I can deepen my understanding of text by engaging in a text-based conversation and response of a poem of multiple perspectives. BY: DEIDRE BARRY- Two Young Girls. I'm 18, and years older than that. I'm 18, and I can't believe I'm that old. breaks, and unable to leave. I would give anything to be done with school. Who cares anyways? I'd drop out, but then my parents would be pissed. At 4:00, we get a five minute break for water, and then it's back for more work. I lace up my Nikes, my new ones. paid per pair, and I can only make so many. These cost me $130, and everyone has a pair. My lungs burn as I run up and down the court, but I know it only makes me stronger. I sew pair after pair, trying to earn enough to buy food and clothes. These shoes hurt my feet. I think I'll buy a new pair. but I always need to work a little more before I have enough. I go home, and lie on my water bed. I can't wait till college. I can get out. What is the poet is trying to say? What is the poet's message or point? 2. Which countries do you think these two young women are from? Why? Do you think that life for young women in these countries is getting better or worse? Why? 3. Which of these women's lives is more similar to yours? How is it the same? How is it different? 4. What else can you imagine about the lives of these two women? 5. The last line of the poem ends with “I can get out.” What does this young women want to get out of? Is she more or less trapped than the other young woman? Why? 6. Stop and jot any other ideas-questions-wonderings. FOLLOW THE THREE B’S, REMAIN ON TASK & COMPLETE AS MANY OF YOUR TASKS AS POSSIBLE IN AN EXPEDITIOUS MANNER. SEE YOU TOMORROW. PLEASE MAKE SURE ALL COMPUTERS ARE PROPERLY PUT AWAY AT THE END OF THE DAY INCLUDING TEACHER’S LAPTOP IF THE SUB BORROWS. THANK YOU. Period One: I can determine cause and effect relationships by analyzing the decisions of historical figures and the aftermath of their decisions. (The slideshow-presentation has been uploaded for the students in the classwork section of our website). Essential question: How does understanding the relationships among individuals and historical events help readers understand text? Compare and contrast the overall structure (e.g., chronology, comparison, cause/effect, problem/solution) of events, ideas, concepts, or information in two or more texts. You will continue working on pages 22-24 in Super Heroes and focusing on cause and effect relationships. How will my learning be assessed? by my ability to identify cause and effect based on the decisions made and the consequences of those decisions. REVIEW SLIDESHOW-PDF FILE AND Read any previous pages in the text and determine the cause/effect relationships. MAKE SURE YOU FOCUS ON PAGES 22-24, TOO. HAVE AT LEAST TWO CAUSES-EFFECTS (OUTCOMES-RESULTS). Why do you think that authors use the cause/effect text structure when writing text? Wrap up-exit slip: How does determining the effect of a historical figures actions help you understand their impact on important events? I can deepen my understanding of current events by creating a summary, and then “taking a side” to the argument of: Is technology more helpful or harmful for people as they shop? What are the risks and benefits? Prior to reading, with your partner: Think of a shopping experience you recently had and consider what make an enjoyable shopping experience compared to a frustrating one. As you read, highlight the 5 Ws of the article and make an annotation explaining your answer to each question: Who is affected by these new stores? What is special about this new way of shopping? Where is this store? When might more stores like this pop up? Why is this type of store important to know about? Also, add the how--briefly describe how the process works. Edit the Write Prompt: Use your 5 Ws highlighting and annotations to create a 5 Ws summary of the article. Author's Purpose: What does the author want the reader to think about the topic? What makes you think that? In the second section it says, “This is because many things can be bought cheaper at Amazon. Especially compared to physical stores people shop at.” Word Choice: Is this word positive, negative, or neither? Why did the author choose to use this word here? Why did the author include this information? What does it show about topic overall? Answer the following questions and try to include text-based evidence to support your perspective: Is technology more helpful or harmful for people as they shop? What are the risks and benefits? Period Three: Math: I can deepen my knowledge of fractions by completing number riddles and by creating my own for a partner to solve. Periods Five and Six: Clubs. Students may work on any work they did not complete in the morning or prepare for book clubs. Period Eight: What stuck with me today? MAKE SURE ALL TECHNOLOGY IS PROPERLY STORED AWAY, SMARTBOARD IS TURNED OFF AND CHAIRS GO UP TODAY. FINISH WHATEVER WORK YOU DIDN'T COMPLETE IN SCHOOL POSTED IN CLASSWORK SECTION. ​WRITING: HOMEWORK. UNPACKING TINY MOMENTS. TODAY, FIND A PLACE IN A BOOK WHERE THE WRITER TAKES A SINGLE MOMENT OF TIME AND SLOWS IT DOWN, STRETCHING THE MOMENT OUT. SEE IF YOU CAN FIND AN EXCERPT FROM LITERATURE IN WHICH ONE ACTION--LIKE PACKING UP A SUITCASE, FEEDING THE DOG, ENTERING THE FRONT FOYER OF A HOUSE, APPROACHING AND ENTERING A FRIEND'S HOME--IS TOLD AS A SEQUENCE OF SMALL ACTIONS AND OF FEELINGS. THEN WRITE ABOUT AN ACTION IN YOUR LIFE IN THIS SAME WAY; TAKE ANY TINY BIT OF YOUR LIFE TONIGHT AND STRETCH IT OUT, SHOWING THE INTERNAL JOURNEY THAT ACCOMPANIES THE EXTERNAL ONE. IF IT WORKS TO DO SO, TAKE A PART OF YOUR MEMOIR AND WRITE IT LIKE THIS. 1. What is the main idea of this paragraph? 2. Is something from the past or future going to help the reader really understand what the character is feeling? 3. Add a scene from the past or future to any parts of your timeline that you think it is needed. 4. Do not over use this feature! 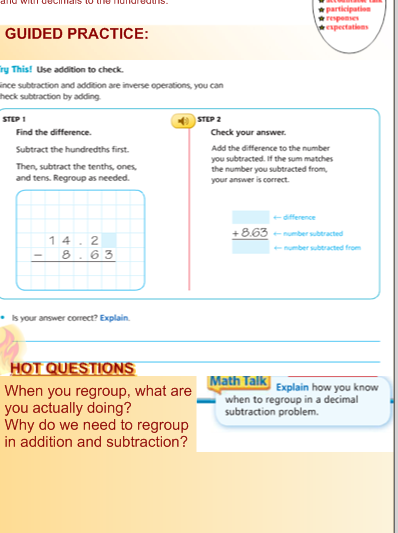 MATH 6.4 AND ENRICH 6.4. BE PREPARED TO DISCUSS AND WORK ON PART TWO OF THE CONSTRUCTING TASK, SHARING CANDY BARS. DATE CHANGES FOR NEXT PARTS OF BOOK CLUBS. THEY WILL BE DONE IN THREE SEPARATE SECTIONS WITH THREE SEPARATE DUE DATES. PART SIX-FIRST SECTION IS DUE NEXT TUESDAY, FEBRUARY 6. THE SECOND ONE IS DUE WEDNESDAY, FEBRUARY 7. THE FINAL PART IS DUE NEXT THURSDAY, FEBRUARY 8TH. PACE YOURSELVES ACCORDINGLY. WORK ON READING AND BOOK LOGS. MAKE SURE TO HAVE MRS. DAVIS CHECK COMPLETED BOOK LOG ENTRIES SO YOU CAN EARN YOUR BOOK STICKERS. PRIZES WILL BE GIVEN TO EVERYONE ONCE YOU COMPLETE 25 ENTRIES. KEEP IN MIND THAT YOU SHOULD BE COMPLETING AT LEAST 45 MINUTES PER WEEK OF I-READY IN BOTH READING AND MATH--IN EACH SUBJECT--90 MINUTES TOTAL. AGAIN, PACE YOURSELVES ACCORDINGLY. YOU DO NOT HAVE TO DO ALL OF IT AT ONCE. EVEN 5-10 MINUTES PER DAY, ADDS UP QUICKLY AND BUILDS SKILLS!!! GOOD MORNING! PLEASE MAKE SURE STUDENTS GET LAPTOPS, SIGN INTO CLASSWORK SECTION AND CIRCULATE TO MAKE SURE THEY ARE ON TASK...THANKS AND HAVE A GREAT DAY. 1. What strategies did Raoul Wallenberg use to save people's lives? 2. What details support the idea that the German and Hungarian authorities didn't know Raoul's job was to save the Jews? 3. What kind of words would you use to describe Raoul? What makes him different from the other "superheroes" we've read about? 4. What are some of the lasting effects of Raoul's life? Attuned to temblors: How well can scientists forecast massive earthquakes? Explain: Based on what you read, what was the main question scientists wanted to answer? Use details from the article to explain the process scientists used to answer their main question. Write a summary between 25-40 words. Also come up with your own QAR questions (right there, think and search, author and me, on my own questions) one in each category. Period Three: I-Ready ELA. Please work quietly on your own with your headphones. Period Five: Math I-Ready. Please work quietly on your own with your headphones. As you work in teams, make sure you answer the following questions: Was the distribution of candy bars fair – did everyone in the class get the same amount? How much of a candy bar did each person get, assuming the pieces were cut equally? • How far away from a whole is your fraction? How do you know? • What if the pieces were halves instead of eighths? How would your answer change? • Did you develop a shortcut to find your answers? • Did you identify any patterns or rules? Explain! WHEN YOU’RE DONE, SHOW YOUR WORK TO THE TEACHER. I LEFT TREATS FOR YOU ON TEACHER DESK IN BACK OF ROOM. ONE FOR PERSON. JACK--MAKE SURE YOU TAKE ONE WITHOUT NUTS. DON’T BE GREEDY. ONE PER STUDENT. Period Eight: Pack up and make sure you clean up. Computers are properly stored and chairs go up. Finish summary, response AND INVESTIGATION for homework. Write a short paragraph explaining how a person in the article changed. Use details from the article to show how they changed. FRIDAY, JANUARY 5TH- ​I will collect Night of the Spadefoot Toad essays on Monday or you may email to me. Will also continue collecting trip forms and money on Monday, too. Make sure computers are properly taken out and put away. Follow the three B’s and I will see you on Monday. Have a great day!!! Period One: Band-Begin Rock Cycle Project. With your headphones, watch Brainpop video and take quiz. Also, read Newsela article and use Current Events form to do your summaries and responses. Add an image. NEWSELA SUMMARIES AND RESPONSES MUST BE COMPLETED BY MONDAY. You may begin researching rock cycle and use printing paper to draw rock cycle--like an infographic. Be neat, complete, colorful and accurate. Use rulers and other tools to help you. Begin Journey of the rock Cycle narrative, diary entry, comic strip or picture book. No matter which one you choose, it must be thorough, complete and contain images--hand drawn or clipart. Period Two: Continue working on rock cycle activities. Also, anyone who has not yet finished ELA diagnostic on I-Ready, must do so immediately. Then please finish Chapter 5 pre-assessment on Think Central. ELA I READY DIAGNOSTIC AND CHAPTER FIVE PRE ASSESSMENT SHOULD BE COMPLETED BEFORE WORKING ON THE ROCK CYCLE WHICH IS AN INDEPENDENT ACTIVITY. Period Three: Correct goals are posted below. Please review and everyone must choose the January goals in each category and then choose at least two of your own goals from each category. They should be completed on small colored index cards. Ask Siri if we can use hers, please. There should also be some on my desk. Just take one or two--just what you need, please and leave the rest so we can use later. TUESDAY, JANUARY 2-HAPPY NEW YEAR! How can you set realistic resolutions-goals? What are they? How do you plan to execute-carry them out? Write about them in one-two paragraphs in your notebook. What are your visions-hopes for our world in 2018? Write 2-3 paragraphs. (Write in narrative form and not as a grocery list). The following will be laminated and put on our desks. We will also revisit academic goals and set new ones. Open the following document and follow directions. You will have three-four goals in each category. However, we will all use the first ones for January. 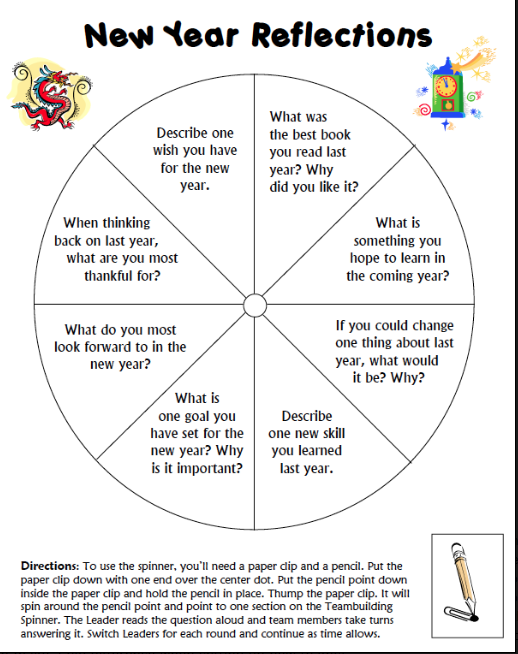 I can get off to a great 2018 start by reflecting on the past year, creating a New Year Reflections wheel and setting new goals for myself.Work on creating a New Year Reflections Wheel. FRIDAY, DECEMBER 15: I AM AT A WORKSHOP TODAY. FOLLOW THE THREE B'S. SEE YOU ON MONDAY!!! Periods 1-3: Dance Club in Auditorium. Students should complete Math Diagnostic Exam in I-Ready. Please make sure to use dividers to help STAY focused. THIS IS A MUST DO FOR TODAY. FINISH MATH DIAGNOSTIC TEST FIRST AND BEFORE ANYTHING ELSE!!! Students should also work on creating holiday letters to war veterans--thanking them for their service to their country and wishing them the best during the holiday season. There’s a holiday template left on the white desk in the front of the room should you decide to hand write and decorate with crayons-markers. You may also type these letters, proofread-spell check and print out. (Don’t forget to sign). You should add images. Students should also finish summaries and responses to Newsela environmental articles. They should print a copy and leave it on desk for me. (A few children have already completed this activity). Students may work on feature article drafts and refer to our writing section of class website for a plethora of helpful resources. Alycia, Jane and Sammy may assist Aaliyah with her story. Students should complete mid chapter checkpoint for chapter 4. I will grade on Monday. There is also a patterns r us math activity left on front white table. BEGIN IN CLASS AND FINISH FOR HOMEWORK. Students may read independently 15-20 minutes but please don’t forget to log into reading notebook and complete entries in book logs when done with books. Periods 5 and 6: Dance club kids should complete Math Diagnostic on I-Ready exam. Again, please use dividers and put away when done. Students who were not in dance or glee club should continue working on the variety of tasks. Students may work on Wonder webquests which are due Monday!!! Glee club: Periods 6 and 7. Gym prep is period 7. Pack up and dismiss at 2:25!!! Chairs up, please!!! ​MAKE SURE HOW UNDERSTANDING HOW AND WHY THE CHARACTER CHANGES HELPS YOU UNDERSTAND THE THEME-BIG IDEA OF THE TEXT. 1. pg. 95 Why does Tabita ask Ben is Mrs. Tibbets has been talking to him about the land? 2. pg. 95-96 Why does Ben open the snake cage when he has been told not to go near it? 3. pg. 98-100 Why does Ben lie to Mrs. Tibbets about where he has been? 4. Come up with your own HOT Question with your thinking. WEDNESDAY, NOVEMBER 29: GOOD MORNING. I AM NOT FEELING WELL. PLEASE DO YOUR WORK, FOLLOW THE THREE B'S AND HAVE A GOOD DAY. Period One: Band-Read chapters 6 and 7 of Night of the Spadefoot Toad. I can deepen my understanding of a character's traits by making inferences about the character. We have discussed creating a theory about a character. Having a theory in mind helps us really understand our character and look for clues that match our theory (and sometimes oppose our theory). Today we want to teach you that as readers you can use inferences to help you understand your character's traits and better support your theory. Inferencing is when you combine text clues & evidence with what you already know to come up with your own theory-idea about the text. 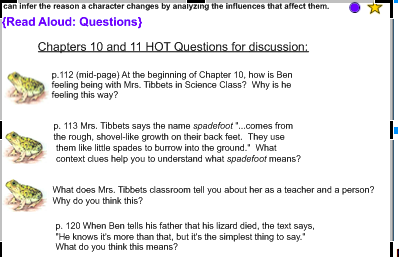 1.What does Ben learn about Mrs. Tibbets throughout Chapter 6? In what ways are Ben and Ms. Tibbets alike? Use evidence from the text. 2.Why does Ben call Toby? What parts of the text reveal the reason? 3. What challenges has Ben been facing? How does he respond to these challenges? Use text evidence to support your thinking. 4. How does Ben find comfort after a day that didn't go well? 5. Share your own HOT question and reflections about it. As you read, look for moments of character thought, feelings and actions. What can you infer about your character based on this moment? Work on developing inferences of your character by stopping and jotting when you find out more about your character. Keep your theory in mind that you had developed. Note moments on post its when your character acts, feels, or says something that is not aligned with your theory. Period Two: Band kids begin working on chapters 6 and 7 of Spadefoot Toad. Extra copies in back cabinet (bottom) if anyone “left book at home” or “can’t find their copy.” Other students please work on your inferring how and why characters change activity. place value to correctly line up my algorithm. 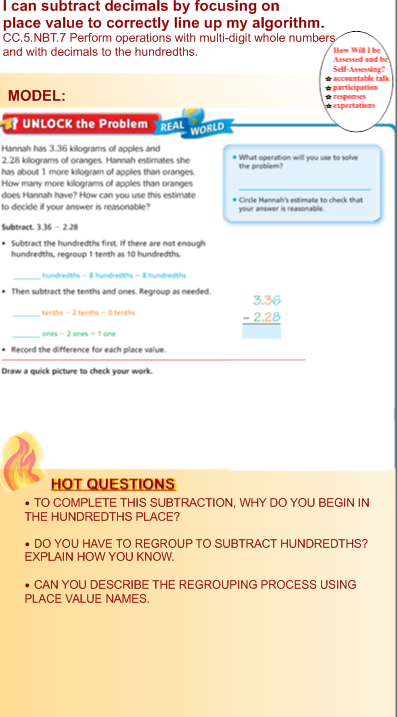 CC.5.NBT.7 Perform operations with multi-digit whole numbers and with decimals to the hundredths. TEACHER’S GUIDE IN UP FRONT IN BIN. COVER IS INSIDE OUT. THAT IS CHAPTER 3. DISCUSS THE FOLLOWING WITH STUDENTS. USE YELLOW CHART PAPER AS NEEDED. MOST CAN WORK ON THEIR OWN. 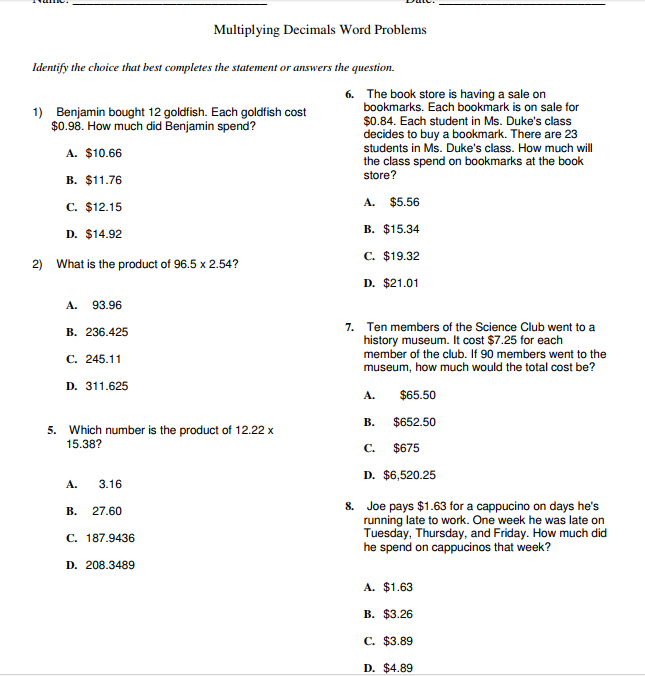 -Challenge: Create a word problem to show when you would need to subtract decimals into the thousandths. Answer essential question in notebook. If finished early, work on Math Iready or ELA I-Ready. Period Seven: Social Studies-work on Wonder activities. Author’s Purpose: What is this article mostly about and does the author seem to have an opinion on the topic? Explain using evidence and add insight.. Remember, when analyzing purpose, look at word choice, text features and angle-focus of the piece? How do you know if this information credible? Today we are going to come up with rules for analyzing a source. Have students read this article to gather information. They should highlight any text that they think will be relevant for when creating the rules to define what's credible. In the margins they should annotate, why they think this will help them evaluate a source. Who is the author and publisher? Is this clear on the source? Is the information intended to persuade, inform, entertain or sell? Is it easy to make out the author’s opinions or point of view? Is the information is free from grammatical, spelling and typographical errors? Apply this checklist by reading a Newsela article such as this one about worm health. After completing the checklist, come to a conclusion about the validity of this source. Have students look over their checklists and add or change any items that they deem ineffective. They should compare checklist answers and whether or not they think this source is credible. Discuss with students the experience of using the checklist to check the credibility of the source. Ask students what about the checklist they would change or if anything should be added. Revise the checklist as a class. Use the revised checklist with another article. Annotate: Author’s Purpose: What is this article mostly about and does the author seem to have an opinion on the topic? Explain.Style: What is this evidence supposed to make the reader think or feel? Explain your answer.Argument: Why did the author include this information? Is this important information on the topic? Why or why not? MONDAY, OCTOBER 30: SEE YOU TOMORROW. FOLLOW THE THREE B'S AND HAVE A GREAT DAY. Period One: Have Jacky, Jane and Erica distribute laptops. If Ethan wants to help, that’s fine. I CAN DETERMINE THE MEANING OF UNKNOWN WORDS BY USING CONTEXT CLUES. 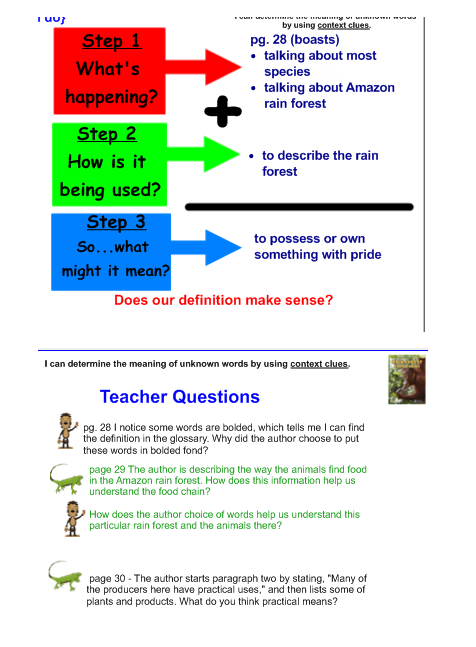 READ PAGES 28-33 IN RAIN FOREST BOOK. ALL WORK WILL BE CHECKED AND ASSESSED BY MRS. DAVIS TOMORROW. SO IF YOU DON’T FINISH IN CLASS, COMPLETE FOR HOMEWORK. 1) How do agriculture and industry endanger the rainforests? Use text evidence to support your answer. 2) On page 31 the author included a text feature – a section called “Gentle Giants.” Why do you think the author choose this as the title of that section? Use text evidence to support your answer. Read your informational text at your seat. Stop when you come across a word you don't know the meaning of. Use the graphic organizer or a post-it and write the meaning of the word. Write your new word in your reading notebook with your definition. You can also think about stopping and jotting when you come across a main idea or a text feature that has helped you. Period Two: Work on Inuit partner webquest. IT IS DUE TOMORROW. NO EXTENSIONS. Period Three: Math: MORE PRACTICE WITH PARTIAL QUOTIENTS: I CAN USE PARTIAL QUOTIENTS TO DIVIDE BY TWO DIGIT DIVISORS. 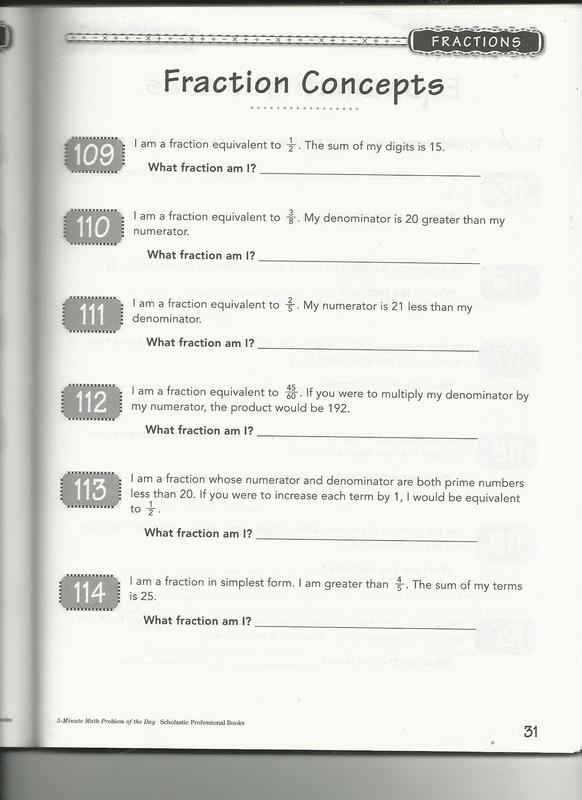 Make sure you finished page 107 in your Go Math books. 10-17 JUST EVEN QUESTIONS. CHECK YOUR WORK. USE MULTIPLES OF 10 OR 100 IF YOU FIND THIS CHALLENGING. If completed, you may go on to page 108. When done, discuss with your math partner. Also, make sure to answer the essential question and the following in your math notebooks: Explain how using partial quotients to divide is similar to using the Distributive Property to multiply. ***Mosi should work on I-Ready Math this period. You may play GO MATH NUMBER GAME WHICH HAS BEEN ASSIGNED TO YOU IN THINK CENTRAL. Club members (not gardening club—dance and glee—put laptops away at 10:55). Gardening club members may work on laptops period five and shutown at 12:40. Period Five: You may work on completing any tasks that were not finished this morning. You may also go to I-Ready Math. Period Six: You may work on completing any tasks that were not finished this morning. You may also go to I-Ready Reading. SHUT DOWN LAPTOPS AND PUT AWAY AT 1.25. Period Eight: READ INDEPENDENTLY QUIETLY. ​GOOD MORNING! MAKE SURE YOUR FIRST DRAFTS ARE COMPLETED FOR PERSONAL NARRATIVES. THEN WORK ON INTERPRETIVE ESSAYS FOR KINDNESS IN COOLER. YOU SHOULD ALSO WORK ON LEAD AND FIRST PARAGRAPH FOR MANGO LITERARY ESSAYS. ALSO, COMPLETE A CURRENT EVENTS SUMMARY AND RESPONSE BY FRIDAY ON DOGO NEWS. MUST BE FROM CURRENT EVENTS SECTION. GOOD MORNING. PLEASE WORK ON YOUR SOCIAL STUDIES WEBQUESTS. IF YOU DIDN'T FINISH CHAPTER ONE ASSESSMENT, PLEASE FINISH. YOU SHOULD ALSO WORK ON YOUR INTRO FOR HOUSE ON MANGO STREET ESSAY (SEE READING SECTION). FIRST MAKE SURE YOUR ORIGINAL EXTENDED METAPHOR IS BEAUTIFUL. USE RUBRIC TO GUIDE YOUR WORK. MAKE SURE YOU ADD IMAGES, BOLDED FONT AND TAKE UP AN ENTIRE PAGE. WRITE NAME AND TITLE ON THE TOP OF THE PAGE. CHECK YOUR ANALYSIS AND MAKE SURE YOUCAREFULLY ANSWERED EACH SECTION. Write a succinct summary of the article that is no more than 50 words. Make sure you include the five w’s and one h. In your response, make an argument for or against renaming Columbus Day as Indigenous People Day. Be sure to give at least two strong reasons for your argument and use specific text-based evidence to support your decision. Remember to restate the question, I strongly believe that Columbus Day should (should not) be renamed Indigenous People Day. The first reason is _____________________. I believe this because in the article, “Austin And Los Angeles Join The Growing Trend To Replace Columbus Day With Indigenous People's Day” it states that… Then add your own thinking. This makes me think that….Another reason I think that we should or should not rename Columbus Day is…. I agree with what the text says that…This makes me think that….